Regular readers will know that I rate Aromatherapy Associates very highly indeed. It's a brand which I only truly discovered once I started writing but which I now regularly use as part of my personal beauty regime. I tend to go for their main aromatherapy line over the skincare or bodycare ranges but I recently tried their Enrich Body Scrub and wanted to share my thoughts. The Enrich range is designed to treat dull, dry, out of condition skin so it's perfect for this time of year. Enrich Body Scrub is a thick, balm style formula which lends itself well to the tub presentation. 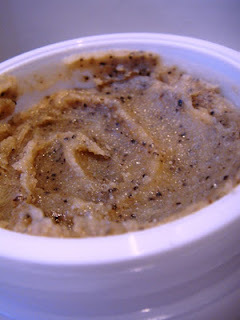 I initially applied the scrub onto dry skin before stepping into the shower but applying to damp skin allows the creaminess of the scrub to come through, adding to the indulgence. A little goes a long way. Enrich Body Scrub contains frankincense and grapefruit, whilst ground coffee makes up the exfoliant. There's no mention of whether Enrich Body Scrub helps in the fight against cellulite any more than other scrubs although the topical application of caffeine is known to help so here's hoping! The scrub itself is midway between abrasive and gentle but it's certainly effective. The predominant scent is warm, woodsy frankincense. It's not offensive but nor is it as pleasant as other Aromatherapy Associates products. My skin was left feeling so nourished that I didn't need to moisturise afterwards. 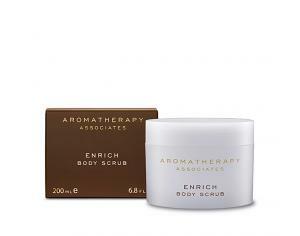 At £33 for 200ml, Enrich Body Scrub is not cheap. Body scrub isn't a product which I necessarily feel you need to spend a great deal on- there are some fab wallet friendly products around and when money's tight, I'd say it's an area you can save on in order to invest in items such as skincare. Having said that, I enjoyed using this and you can tell that its a quality product so if you have got some pennies to spare, I'd recommend checking it out. I have yet to try this product but I am already convinced of its efficiency. I can't wait to buy it. For 33 bucks, this surely sounds like a bargain! If you don't have enough cash to go to a spa or ear candles clinic, this is the best treat you can have at home.